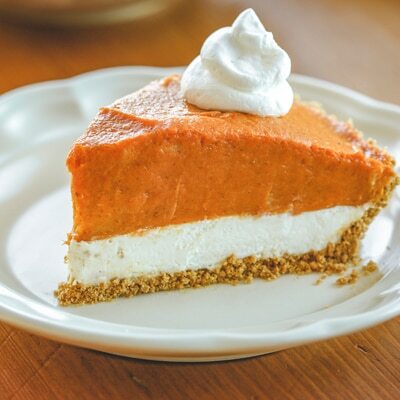 Double Layer Pumpkin Pie is beautiful and delicious! You will get double the flavor and color too. COMBINE cream cheese, 1 tablespoon evaporated milk and sugar in large bowl with wire whisk until smooth. Gently stir in whipped topping. Spread on bottom of pie crust. POUR 1 cup evaporated milk into bowl. Add pudding mixes. Beat with wire whisk for 1 minute (mixture will be thick). Stir in pumpkin and pumpkin pie spice with wire whisk until well mixed. Spread over cream cheese layer. REFRIGERATE for 4 hours or until set. Garnish with additional whipped topping, if desired. * NOTE: 1 teaspoon ground cinnamon, 1/2 teaspoon ground ginger and 1/4 teaspoon ground cloves can be substituted for pumpkin pie spice.